Our tale begins two and a half years ago in my cramped apartment in Oakland, California. Corporate America was off to the printers, and I suddenly found myself without many immediately pressing to-do list items. With my days calming down, I wondered what I’d focus on next. I’d come up with a number of games, but none of them seemed promising enough to really push forward. But as I thought about what I wanted to work on, I asked myself what I wanted to play, and the answer was obvious. At that time, I was completely hooked on drafting Magic cards, but there were two problems. First, the game is unreasonably expensive. Second, after you draft cards, you’re stuck playing with your cards for several hours, which often feels like a chore, especially if the draft goes poorly. Was there a way to capture the joy of drafting without having the experience watered down with a long and separate non-drafting part? After giving it some thought, I came up with the idea of a game where players alternate between drafting a single card to add to their hands, then taking turns playing cards from their hands. Soon after, on a backpacking trip, I spent lots of time brainstorming supporting mechanisms, which involved players colonizing a board with stacks of cubes. I had the whole system lined up and ready to put on cards when I got home. I also spent some time brainstorming themes. The game started mechanically, but it needed something to anchor players. I considered two themes. The first was players wheeling and dealing as the owners of a bicycle factory. The game featured circles within circles (card pools being passed around the table, players taking turns around the table, the board was a circle made of smaller circles, etc), so something with gears and wheels seemed appropriate. 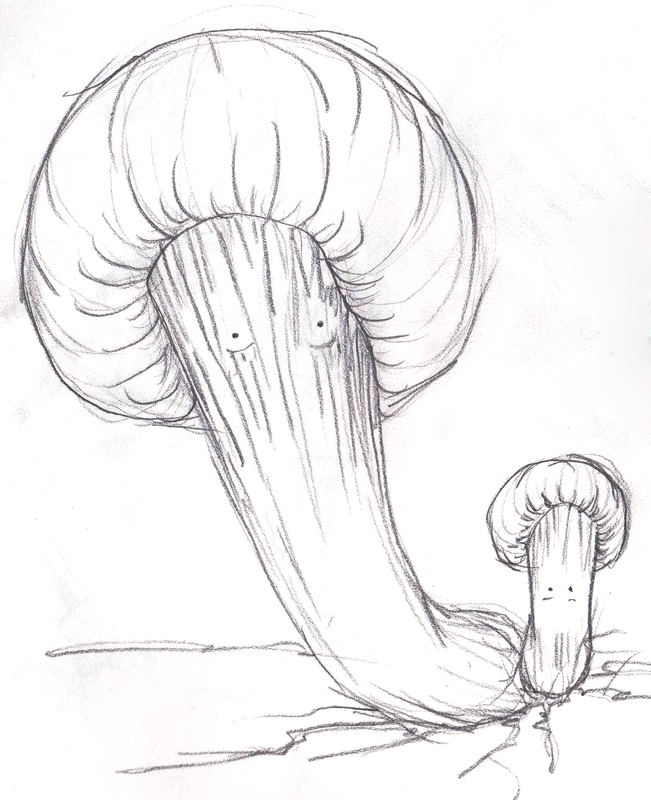 See, fungus can have personality! 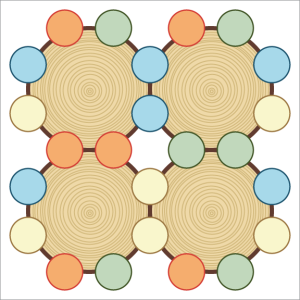 The second theme was fungus growing on a pile of logs. I’d always wanted to make a game about fungus, and the mechanics seemed to fit just well enough to work. I ended up picking this theme and trudged forward. And while you might scoff at the theme (as many people did), it definitely appealed to a significant minority of its playtesters. That’s right, the game I’m talking about here is Fungus. Over two years ago, I wrote two articles about Fungus, one on the design goals for the game, and one on how those goals helped shape the decisions I made about the game design. Though I never wrote much more about the game here on the blog, I worked on it tirelessly for many, many months. I went through a dozen iterations. I ran blind playtests. I even built up a decent fan base for the game. But after thinking that Fungus was going to be the next Nothing Sacred game, two things happened that totally derailed it. The first was a series of bad playtests. Now, playtests that go poorly are often exactly what you want, since they expose problems that you need to fix. But bad playtests also take a toll on morale, especially when you feel like the game is good to go, as I did with Fungus. I’m happy that I discovered the problems before taking the game to Kickstarter or something silly like that, but it was still a shock to my forward momentum. For the curious, the two playtests in question involved the game going way over the intended time (something I was working hard to address), and feedback saying that the way to score in the game was boring (though the actions in the game that didn’t score points were fun and exciting). Bad playtests alone wouldn’t have forced the game to the back-burner, but at the same time those playtests were shaking my confidence in Fungus, I went on a camping trip that inspired Shadow Throne. Another drafting game, Shadow Throne took lessons I learned from Fungus and was fresh and exciting, exactly what I needed to get over the disappointment with the last few Fungus playtests. So Fungus was tucked away in my cabinet of ancient prototypes and I excitedly started working on Shadow Throne (and soon after that Birds of a Feather). But while Fungus was down, it wasn’t out. I kept thinking about it, and fans kept asking me about it. 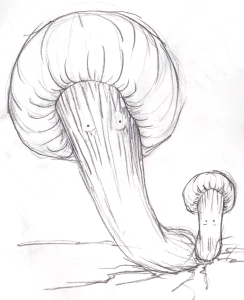 So after almost a year, with Shadow Throne more in the hands of the artist than me, I sketched out the next generation of Fungus. But things were going to be a little different this time. For starters, I decided to go with a less controversial theme. Like I said, many people liked the quirky fungus theme, and I think art could have made it accessible to even more people. But some people hated the theme. Plus, it was really difficult to come up with more than a hundred unique cards that were all about fungus. Say goodbye to the iconic board of Fungus. 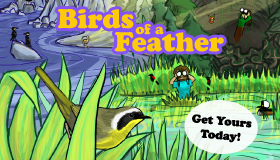 The second big change with this new version of the game was significantly reworking the mechanics. The board you colonized was gone. Instead, players gained abstract skill, then translated that skill into reputation by performing impressive feats of magic. And you didn’t win by spreading spores, you won by writing chapters to create the most influential manuscript possible. Sounds fun, right? Well after hours and hours of work (remember, this game involves more than one hundred unique cards, not to mention supporting components like tokens), I was ready to try it, and it was fun! But it still had some issues. Even though my months of testing Fungus meant I understood the system fairly well, this was close to a totally new game, so it shouldn’t be surprising that there were problems. And those issues were not superficial–they were issues with the core underlying system. But a combination of being busy and a plethora of other projects (these days, I often have half a dozen games at various stages of development at any given time) meant that progress was slow on Wizards, as I’d taken to calling it. So it was months before I found myself on yet another trip, with plenty of time to think, before I yet again completely reworked the system. And while it wasn’t as much of a radical change as last time, it was definitely a major revision. Chapters and reputation were removed, and instead players simply gained prestige for each magical feat they accomplished. All tracks were removed, and mini-cards were added to be used as tokens. Potentially out of control combos and lengthy turns were limited by preventing players from having too many active powers at once. After the dust settled, things were looking great! Like any early prototype, some tweaks were needed, but the core system proved to be very promising, solving the problems of previous versions. Which leads us to today. I’m still working on tweaking individual cards to control the overall feel of the game and for balance, but the main system feels complete. It’s a good place to be. Before I look to the future, I want to discuss the theme of the game. It changed from fungus to wizards studying magic, which might imply that the theme really doesn’t matter or is superficial. But that’s not the case. The core system can handle many different themes, but once a theme is chosen, it will warp the particular implementation of the game in really interesting ways. I’ve been having a ton of fun coming up with an elaborate backstory and unique characters for the game, and in turn they have helped determine what cards will make an appearance and which mechanics will feature prominently in the game. Three generations of a relatively stable card. Ok, one more thing before I discuss the future. Those of you who have followed Nothing Sacred Games for a few years know that naming games is always a challenge for me. 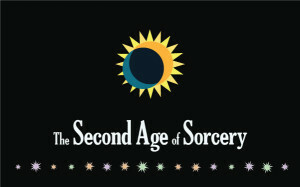 This time, I’ve decided to tackle the problem earlier, and have picked a new, evocative name for the game: The Second Age of Sorcery. What do you think? So, that’s the current state of Second Age. But what does the future hold? I’m taking a different approach to Second Age than my past few games. Instead of raising funds through Kickstarter and self-publishing, my goal is to find an existing publisher to pick up the game and take it to market. Why? There are a couple of reasons. First, while Nothing Sacred Games has had amazing success in terms of producing games that have been well received, it hasn’t been a huge financial success. Combine that with the fact that I suffered a couple of monetary hits earlier this year (a stolen car and a broken bone), I need to dedicate myself to more profitable ventures in the near future, which means I won’t have time to finish Second Age and bring it to market myself. Second, I’m looking forward to seeing what a more established publisher can bring to a Nothing Sacred game. I consider myself a game designer first and foremost, so I don’t feel bad admitting that my skills in other areas of game creation are a little weaker. In particular, I look forward to getting balancing, art direction, and mostly marketing help for the game. I like to offer advice in all of my articles, so I thought I’d finish today’s with a couple of lessons that I hope will help other designers. First off, it can be really useful to take a break from a design now and then. Banging your head against a brick wall will only get you so far, and sometimes taking a step back will help you realize there’s a door right next to where you were standing. Even if there’s a risk you’ll never come back to it, don’t be afraid to shelve a game you’re working on with the plan of returning with a fresh perspective later. Second, listen to your playtesters. It can be difficult to accept that your game has fundamental problems, but it’s much better to accept the facts than to press forward with a broken game. Finally, don’t be afraid to make radical changes to a game, even if you feel like the game is finished. It can feel like you’re giving up and starting from scratch, but much of what you’ve learned will still be applicable. If I were to show Second Age to a playtester who tried Fungus, she probably wouldn’t be able to recognize it as the same game, but Second Age wouldn’t be possible without all of the lessons I learned from Fungus. Much of any design process is creating for the sake of learning, not for the sake of the creation. 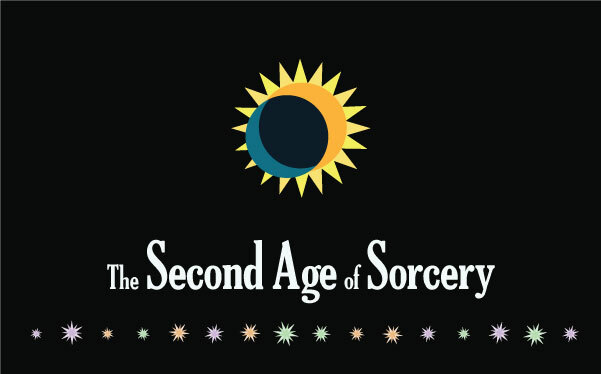 That’s it for Second Age… for now! Second Age has already taken me to some unexpected places, and I’m looking forward to sharing with you where it takes me next! As always, I would like to thank my generous Patrons for the support and encouragement that made this article possible.